It seems like just yesterday I was preparing 2013’s year-in-review blog post and planning for 2014. What a year it’s been! As it turns out, we saw a lot of changes to our industry in the past year – from speech-generating device coverage reminders to capped rental to the expansion of the online therapy world. As we close the year, we look forward to building new relationships, expanding our offerings, and adding additional resources to help clinicians, individuals, and their caregivers. 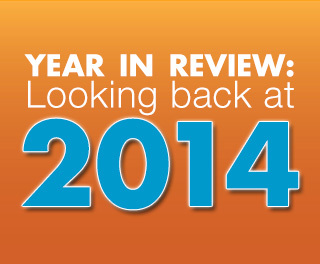 The speech community spent most of 2014 anticipating changes to the reimbursement of speech-generating devices (SGDs). Early in the year, The Centers for Medicare and Medicaid Services (CMS) implemented a 13-month capped rental system. This system means that instead of owning the SGD immediately after placement, individuals now rent an SGD for 13 months before they own it. While this was a big change for the industry, our service and commitment to the individuals who use our devices never wavered. Additionally, we spent much of 2014 addressing CMS’s coverage reminders for SGDs. While this project brought a lot of uncertainty to the industry, it gave our team an opportunity to work with other SGD manufactures, numerous clinicians, the speech community, and legislators on Capitol Hill. The entire industry was pleased when CMS announced its intention to create a new National Coverage Determination that aligns more closely with the dedicated devices available for speech generation. In 2014 we added new team members, introduced cognitive exercises for TalkPath Therapy, and worked with thousands of speech-language pathologists (SLPs). The new faces and partnerships helped advance our commitment and mission to improve the lives of those we serve. I hope you had a chance to meet and engage with many of our new team members on the telephone, in-person, or at the national ASHA convention this past fall. I know I enjoyed meeting many of our Faces of Aphasia partners, SLPs, and other clinicians and aphasia advocates this year. Our product lines also grew in 2014. Now, our AllTalk model is available with EyeGaze, which means we can assist adults who need to use their eyes to access and communicate on a device. Combine this technology with our highly customizable icons, and individuals can rest assured they are receiving a device that fits their unique needs. It’s with great excitement that we can look ahead now to 2015. We continue to improve and grow our clinical offerings while reaching people with new speech, language, and cognitive disorders every day. I hope you will continue to keep Lingraphica in mind for all of your future needs.